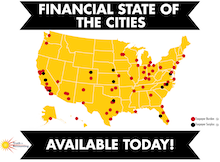 If you thought your local government was in bad shape, check out our newest report on the financial state of the federal government. Read the full report here. 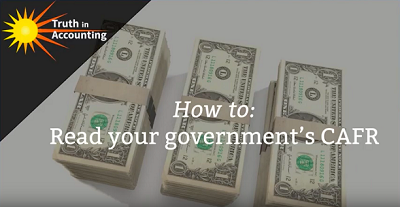 We ventured out on the streets of Washington, D.C. to get people's opinions on Tax Day. Watch the video here. A government's comprehensive annual financial report (CAFR) can be long and confusing. We break down the important sections in this new video. 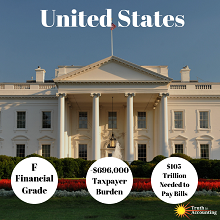 Read our newest report on the Financial State of the Union, which found that the financial condition of the U.S. government worsened by $4.5 trillion in 2018. 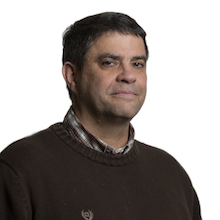 Bill Bergman serves as TIA's Director of Research. He is responsible for managing TIA's federal project and State Data Lab's data base. Bergman spent 13 years as an economist and policy analyst at the Federal Reserve Bank of Chicago. Read the newest report on the fiscal health of the 75 largest U.S. cities. 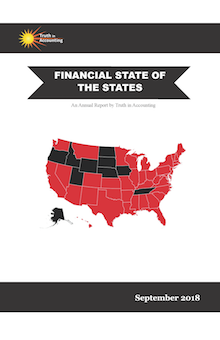 Click here to read Truth in Accounting's newest Financial State of the States report. Compare all 50 states and the 75 most populous cities using more than 300 unique data variables. Part of the probe looked at whether Insurance is complying with a state law to examine…public safety pension funds every three years. When was the last time college students ever got together to protest a USD $22 trillion and rising national debt. Do they understand the threat even? Isn’t this Liberal government doing exactly what they accused the previous PC government of doing? Get this in your e-mail. Subscribe below. Receive our newsletter, updates, and important research in your e-mail box. Upon request, Truth in Accounting will calculate your state or local government's true financial condition. We can also perform state and local government financial report data mining, detailed pension plan analysis and calculate each taxpayer's share of your city's or county's financial hole. Truth in Accounting offers a number of publications for download, including our annual "Financial State of the States" report, "Truth About Balanced Budgets: A Fifty State Study", and "Illinois Budget Transparency Study"
Compare your state to others with our simple graphic tool which provides easy access to Truth in Accounting assets and liability data, as well as selected economic and demographic data. 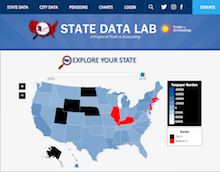 State Data Lab allows you to print, link or save the graphics you create. You can also easily share your personalized graphs on social media.